Brenda is a fabulous designer, as well as a really sweet person! She even mentioned me, along with many other crochet designers, on the acknowledgements page of her book! Now that’s really nice! There are 16 projects in Brenda’s book: 2 boot cuffs, 1 jar cozy, 1 bag, 3 headbands, 3 cowls, 2 mitts, 2 sweaters and 2 afghans. Each project includes written instructions, as well as a color chart. The projects look like they’re knitted because Brenda has worked them in the Tunisian Knit Stitch and the Tunisian Purl Stitch. If you’ve never done these stitches before, don’t despair! 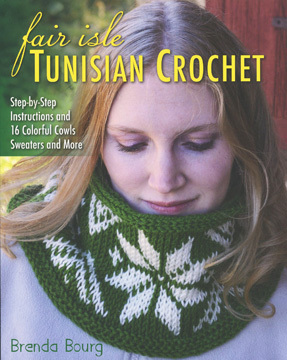 Brenda has included complete instructions in the front of the book along with color step-by-step photos explaining how to work the Tunisian Knit Stitch, the Tunisian Purl Stitch, the Tunisian Seed Stitch, increasing, ribbing, the foundation row and binding off. Almost all of the projects in the book have no shaping, except for a little on the 2 sweaters. 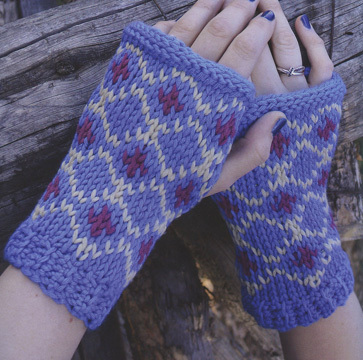 The Ivana Mitts look really nice and don’t look too hard to make. They’re made in flat rows, then the right and left edges are seamed, leaving a hole for the thumb. I absolutely LOVE the Annabel Bag! I love the striking contrast between the black and the multi-colored yarn (it’s Red Heart Boutique Unforgettable, which is one of my favorite yarns!). At 16″ wide x 14 1/2″ long, the bag is a nice size to use for crochet/knit projects! 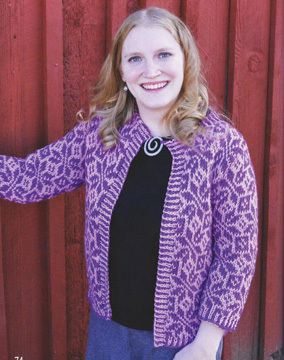 The Cora Sweater has a really nice all over snowflake-like pattern to it. It looks super comfy and I can imagine wearing it with lots of outfits! I LOVE the Elisha Afghan! It looks like it could be made in joined squares, but it’s worked in 1 piece, eliminating the need for seaming. 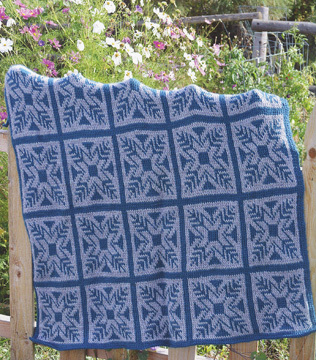 I love the colors in this afghan and the snowflake design, too! This is just a sampling of the projects in Brenda’s book. 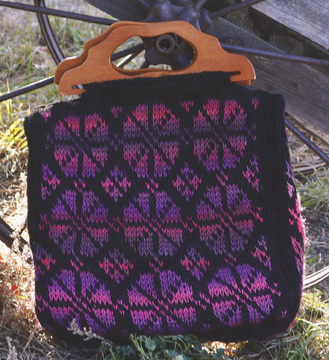 To see all the projects in this book, check it out on Ravelry here. If you’d like to order this book, check it out on Amazon here. The book retails for $21.95. It has 16 projects on 112 pages with lots of color throughout. Now for the fun part! The publisher has graciously agreed to let me give a copy of the book away on my blog! 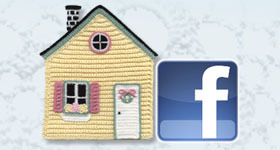 If you live in the US and would like to win a FREE copy of Brenda’s new “Fair Isle Tunisian Crochet” book, just leave a comment below and you’ll be in the running! And if you’re subscribed to my blog, you’ll get 2 entries in the book giveaway! I’ll pick and announce the lucky winner at random on Tuesday, March 1st. So stay tuned to hear who wins! I hope you’ve enjoyed this book review. Good luck everyone! This entry was posted in Book review, Crochet book, Crochet technique and tagged crochet book, crochet techniques. Bookmark the permalink. Wow! What a lovely book! Thank-you Susan for calling it to my attention & for the fabulous review. Would love a chance to win a copy! You’re very welcome. I’m always glad to recommend good books! Good luck in the giveaway! Happy Dance….these projects are SO cool! I want to make the purse and the sweater and the blanket……. Yes, these projects ARE cool! Good luck in the giveaway. I would Love to learn how to do this crochet style. It’s a great crochet technique. I think you’d enjoy it! Good luck in the giveaway. I have been doing Tunisian crochet for several years. I particularly love using a double ended hook and crocheting in the round. I would love to learn a new way of using this technique. I don’t think I’ve done Tunisian crochet in the round. It sounds wonderful! Good luck in the giveaway! I’ve never sen fair isle Tunisian before – it sounds like a great combination to try! Yes, it’s a great combination! I hope you get the chance to try it.